Hello readers of CTG! I’m going to try out a new monthly article highlighting some of the big releases from the current Previews magazine. For those of you who are unfamiliar with Previews it is a giant monthly publication which features every comic and tons of comic-related merchandise which will be sold in shops across the world 2 months in advance. Each month I’ll flip through the giant publication and give you the run down on what I think will be the hottest titles and of course the stuff I’m looking forward to broken down by publisher. I’ll try to have a nice balance of both weekly releases and trades to appeal to both types of readers. Let me know if you enjoy it and I’ll continue putting this together every month. The July catalogue of Previews covers everything being released in September. That’ll give you plenty of time to add anything that might interest you onto your pull list. Now as they say on with the show! 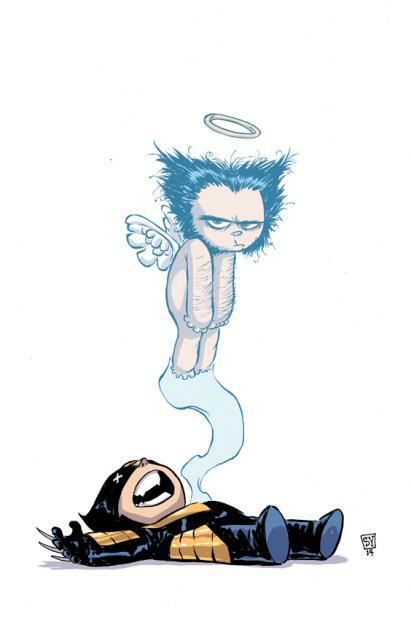 Death of Wolverine #1-4: Being hailed as the single most important X-Men event of the decade. Logan has lost his healing factor and all indications are this is the end of Wolverine. This 4 issue event will be released weekly in September and is being written by Charles Soule and drawn by Steve McNiven. Avengers #35 and New Avengers #24: The next big Marvel event begins here with these two special double-sized issues titled the March to Axis. Edge of Spider-Verse: Another big event kicks off this month in the Spider-Man titles. It’ll feature its own 5 part mini-series as well as tie-in with all the Spider titles. The event spans through multiple universes and will feature all the Spider folk from past and present. Black Widow #10: Black Widow VS Hawkeye...nuff said! Thor: God of Thunder #25: God-sized 25th issue featuring a great artistic lineup consisting of Esad Ribic, Simon Bisley, and RM Guera. A few different story lines are covered in this issue including the fall-out from Original Sin. Hawkeye VS Deadpool #0 (of 5): Kicks of what looks like a fun mini-series written by Gerry Duggan and drawn by Matteo Lolli. The tagline says it best, “It’s a Hawkeye & Deadpool comic 75 years in the making, give or take 75 years.”. 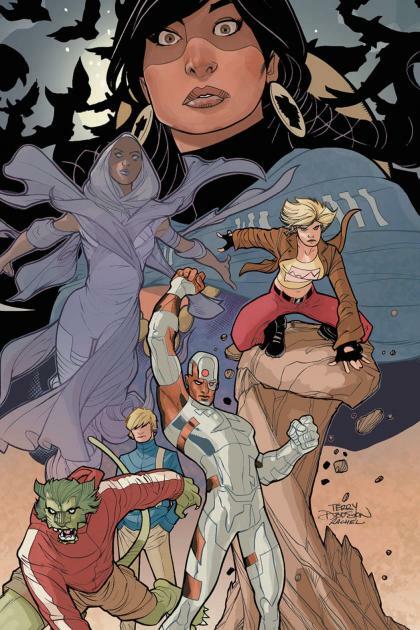 All-New X-Men #32: Those wild mutants are dimension hopping again! This time they encounter Ultimate Universe Spider-Man, Miles Morales! Being a big fan of Miles I’m really curious about this one. I’d really love to get Morales into Earth 616. Noteworthy trades: Quite a few volume ones coming out in September for all you trade waiters, Amazing Spider-Man, Moon Knight, All-New Ghost Rider, All-New Ultimates and Deadly Hands of Kung Fu. There’s also the collected version of the Doop mini-series. Two second volumes I’ll be picking up are Guardians of the Galaxy and Miracleman. Multiversity: The Society of Super-Heroes: This stand alone issue acts as chapter two of the overall Multiversity storyline. It’s written by Grant Morrison with art by Chris Sprouse and Karl Story. Admittedly I’m not usually an event guy but I am looking forward to this one. Names #1: An 8 issue Vertigo mini-series written by Peter Milligan and drawn by Leandro Fernandez. It’s being called “the Wolf of Wall Street meets Kill Bill”. I’m aboard for this one! Teen Titans Earth One HC: I don’t know much about the Teen Titans but this Earth One original is written by one of my favorites, Jeff Lemire, so I’ll be picking it up. It also helps that I’ve enjoyed all the Earth Ones that have been released so far. Noteworthy Trades: Without a doubt if you’re a trade-waiter get ready for a fantastic read, September is the official release date for the hardcover edition of Scott Snyder and Sean Murphy’s The Wake. The entire 10-issue series is collected here and it’s a dandy...so far (the ending hasn’t come out yet!). Another Snyder favorite Batman volume 4: Zero Year-Secret City also comes out this month. It collects the second story arc of Year Zero. Prometheus: Fire and Stone #1 (of 4): The first issue in the blockbuster DH event connecting Aliens and Predator to Prometheus. This first issue ties directly into the movie with a new team of explorers trying uncover what happened to the members of the original mission that never returned. The preview pages look fantastic. I really can’t wait for this event. Aliens: Fire and Stone #1 (of 4): Being labeled as the first issue in an exciting direction for Aliens. It of course ties into the big event surrounding the franchise. Again the preview pages look amazing and I have a great deal of faith in the writer, Chris Roberson. This event looks to be starting with tons of great Alien action! Grendel VS The Shadow #1 (of 3): Written and drawn by the legendary Matt Wagner this is not only one of my most anticipated books of the month but also of the year! It’s being labeled as new reader friendly so jump onboard for is pretty much a guaranteed fantastic read. If you are new to Grendel, DH released some very affordable omnibus collections of the series which I also highly recommend. Concrete Park: R-E-S-P-E-C-T #1 (of 5): Hmm this is a new one for me but after reading the premise I must say I’m intrigued enough to check out the first issue anyway. It’s a sci-fi saga about a troubled young outcast from Earth awakening on a distant planet gripped by gang war. Groo VS Conan #3 (of 4): The adventure continues with issue 3. Don’t sleep on this one folks, Sergio Aragones is a legend in the comic world. Devour anything he puts out! Usagi Yojimbo: Senso #2 (of 6): Same goes for Stan Sakai. This series is celebrating the 30th anniversary of Yojimbo. I can’t recommend Usagi enough! Buy this and love it and then pick up some previous trades! Noteworthy Trades: I’ll be checking out the first volume of Tomb Raider, Season of the Witch, written Gail Simone. Being a Simone fan I wanted to buy this in weekly floppies but my budget said otherwise. Same goes for Frank Barbiere’s The White Suits. Read the first issue and loved it so I’ll be sure to pick up this trade. Fans of Greg Rucka who trade wait are in for a nice treat as his latest mini-series, Veil, collected in hardcover format is available for pre-order this month although the official release date is November 12th. Image, as always, has a ton of great upcoming releases. I’ll have to brief with each title so if you think you might like it give it a quick Google search to get more information. There’s just too much to go into big detail. 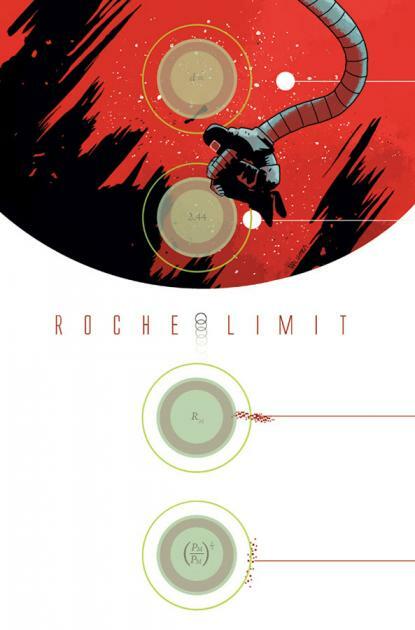 Roche Limit #1: Writer Michael Moreci and artist Vic Molhotra bring us an all new crime-noir style sci-fi adventure. Filled with space exploration, colonization, mystery, and shadowy underworld figures this tale uncovers a potential grim future for mankind. Copperhead #1: Writer JAY FAERBER and the art team of SCOTT GODLEWSKI & RON RILEY bring you this gritty 24th Century Western with an extra-long first issue for the regular price of $3.50! God Hates Astronauts #1: New ongoing series marks the return of writer and artist’s Ryan Brown’s hilarious vision. The original cult classic is also being re-offered in trade format but this new series is also said to be a perfect start for new readers. Oddly Normal #1: Written and drawn by Otis Frampton this looks like a fun all-ages read. A tough one to describe but it centres on 10-year old Oddly who must travel to a magical land of Fignation to uncover the mystery of her parent’s disappearance. Lazarus #11: One of my favorite ongoing series by the team of Greg Rucka and Michael Lark, this issue marks the beginning of a new story arc “Conclave”. For the first time in 65 years the 16 Families are gathering again! Can’t wait! There are also 3 Mark Millar ongoing titles that I’m really looking forward to, MPH #5, Jupiter’s Legacy #5, and Starlight #6. Noteworthy Trades: There’s a pile of them! The ones I’ll be on the lookout for are: America’s Got Power, Revival volume 4, Undertow volume 1, Southern Bastards volume 1, East of West volume 3, and Great Pacific volume 3. There’s actually a ton of ongoing titles that I love coming out from Image but I think my article is getting too long. I don’t want to bog you down with everything I’ll be checking out. You should really frequent the Image Comics site and check out they’re preview art and upcoming releases. They have so many worthwhile titles each and every week that I haven't covered like Black Science, Deadly Class, etc. G.I. Joe #1: A reader friendly GI Joe relaunch brought to us by writer Karen Travis and artist Steve Kurth. Cobra has become an international peacekeeping force and the future of the Joes looks bleak. Yo Joe, I’m on board! Also a quick plug for Tom Scioli’s Transformers VS G.I. Joe #3, the Free Comic Book Day issue of this series was fantastic and I expect the series to be no different. Annihilator #1 (of 6): This story tells the tale of a washed-up Hollywood writer who must join forces with his own fictional character to stop the entire universe from imploding. It’s brought to from the mind of the one and only Grant Morrison with art by Frazer Irving. 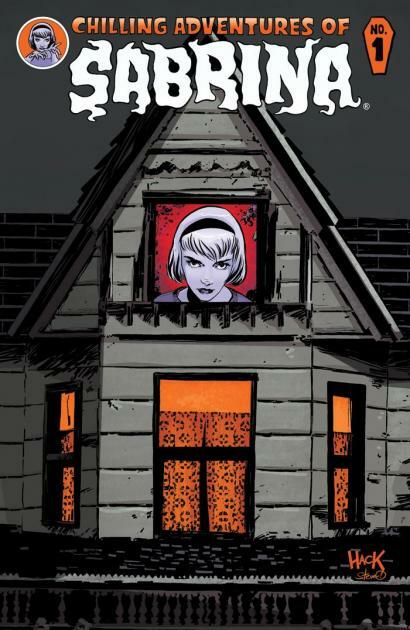 Sabrina #1: The popularity of Afterlife with Archie has spawned on offshoot horror title starring Riverdale’s witch Sabrina. It is written by the same author, Roberto Aguirre-Sacassa. If you like Afterlife this will be a good one to check out for sure. And that’s it folks. Let me know what you think. Is it too long? Did you like it? Do want more details? Let me know if you want me to make this a monthly feature on CTG. I'm not much of a Spider Reader but I'm way down for that Spider Verse gig. Gwen Stacy as Spider Girl looks out of this world! Also I will certainly be grabbing all them Alien/Prometheus issues. Can't wait! The Alien Predator Prometheus event looks bananas! Did you get a chance to look at some preview pages online? It really looks great. I read Spidey off and on, I think I'll try a few issues of the event to see if it grabs me. What do you think of the article? Too long? Should I reign it in a bit? The preview pages, plus an interview with Kelly Sue, really sold it for me, beause I was a little iffy on it prior, but now I'm seriously jazzed for it. Also given how large the Previews actually are, this is an impressive size in just narrowing it down to the gems. I think it's good! Forskolin Hey that was great to read. Thanks for the great post .Loved every part of it. These journet center from different catalogues are really interesting. Only goes to show how different Marvel perspective can be illustrated and given importance. There are a lot of Marvel character lovers via buy research paper here who also passionately illustrates different Marvel characters.